It’s been a while since I reported in. I had hoped by this time to have heard one way or another about the potential funding from Switzerland on this project. But alas the response time has been continually delayed for one valid reason or another. And so eventually I will indeed, hopefully very soon, hear about the Swiss money. Meanwhile waiting has been the soul testing dilemma it often is in life. It is approaching two years since I was last in Europe interviewing puppet folk. And I have to get back there again or the Gravity From Above will dry up on the vine. And I’m NOT going to let that happen. I am thinking of other kinds of funding. (Unfortunately it was strongly suggested that we should only get the money from the Swiss… so I wait for a conclusion to this effort. And I still have hope!) Meanwhile I am seriously considering the crowdfunding route again. (I hate the sound of the word ‘crowdfunding’.) It is a tedious and frankly slightly humiliating process. I really don’t understand why the creative person should also be marketing themselves. Yeah I know welcome to the realities of the 21st Century. But what I wouldn’t give for a patron! 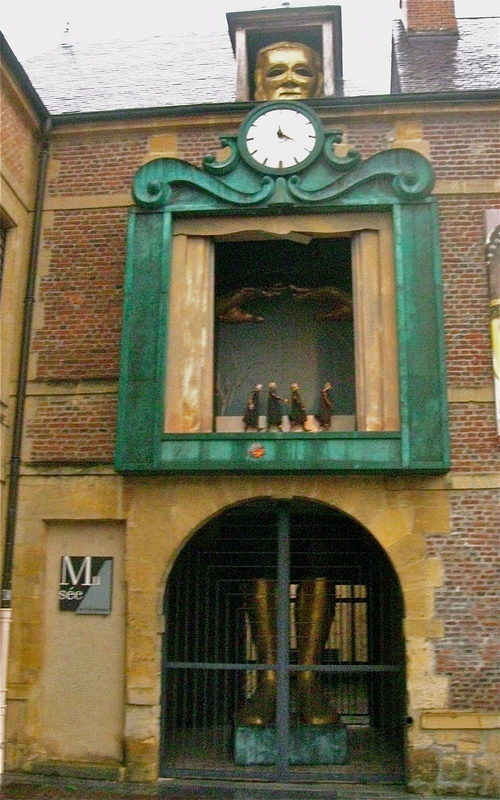 The Puppet Clock at ESNAM, the international school for puppetry, in Charleville-Mézières in France. I haven’t been sitting still though. I’ve been researching a few other fields of exploration. 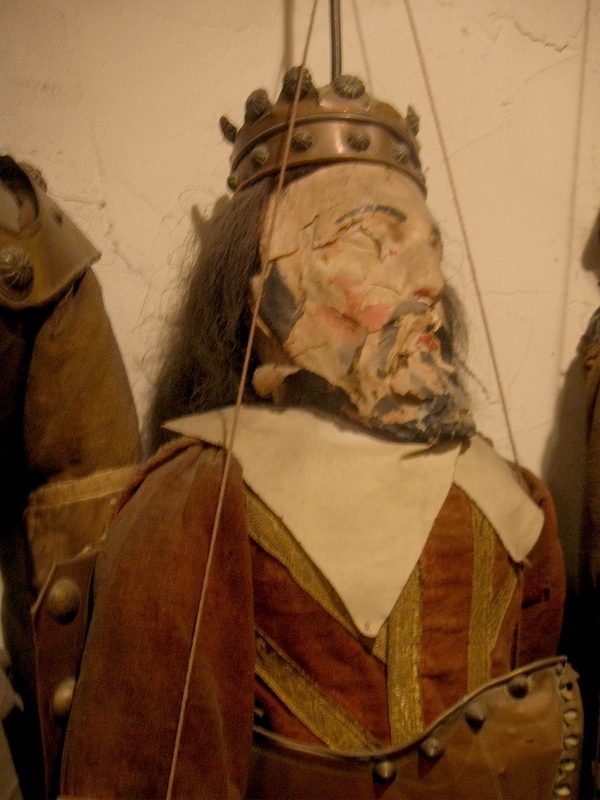 Sicilian marionettes simply can’t be ignored. The endless saga of Orlando Furioso, hundreds of chapters per cycle, is unique and really a throwback to the Middle Ages. Then there is the work of Rezo Gabriadze in Tbilisi Georgia (on the very edge of Europe) whose puppet play, The Battle of Stalingrad, reinterprets the great tragic battle as seen through the eyes of animals. And, if relations hold, I really need to get myself to the Obraztsov Theatre in Moscow. 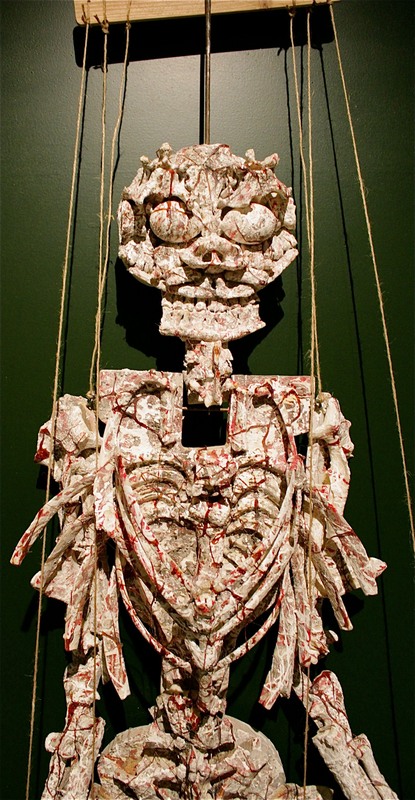 And finally a young puppeteer in Denmark found me and maybe I should get myself up there. Not to mention all of the places I need to get back to. 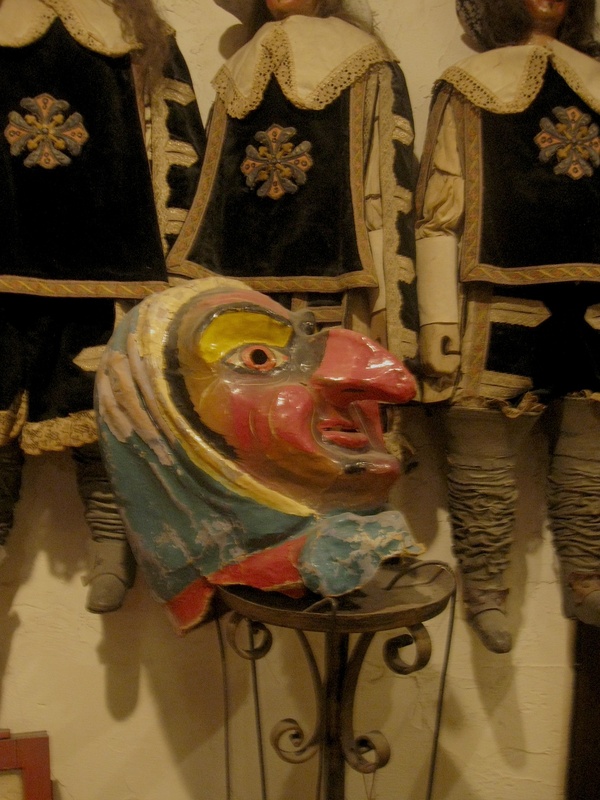 A Well Used Puppet Hanging Up in the Museum at the Toone Marionnette Theatre in Brussels. Thanks for following along. I am far from finished and far from giving up. Just learning the spiritual side of patience. This entry was posted on August 3, 2014 by The Anadromist. It was filed under Art, Belgium, Brussels, Charleville-Mézières, Czech Puppets, Documentary, ESNAM, France, French Puppets, Georgia - Country, Gravity From Above, Italy, Jan Svankmajer, Le Théâtre Royal de Toone, Puppet Documentary, Puppet Film, Rezo Gabriadze, Sicilian Marionettes, Theatre .